‘Tis the season so they say, which means Christmas crafting begins in earnest. I know most sensible people sort this stuff out way back in August, but I just never seem to get round to it that early. December always creeps up on me, I turn around and Pow, there it is and I’m not ready! I have too much stuff so I’m trying to use up only things I already have this year. 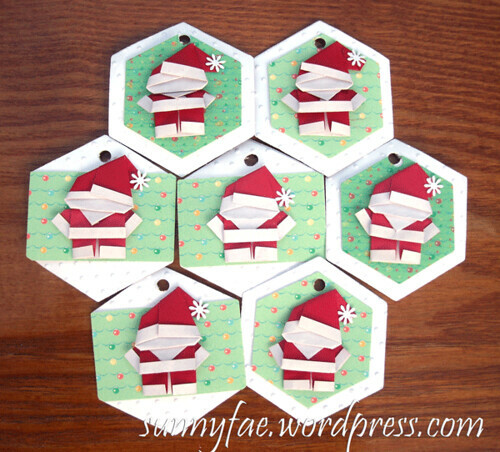 I found a cute Santa tutorial here and tried a little origami for the tags. I don’t have any two-sided origami paper but I managed to find a couple of red envelopes that were white on the inside. The tutorial doesn’t give a size for the little squares, they’re really tiny so I experimented and decided 1 ½ inches was about the right size. I made a simple patterned paper on the computer with little baubles and streamers (something chrismassy) and used it for both the tags and the cards further down. I don’t put ribbons through the tags till I wrap the gifts so I can use something that matches the paper I use. I was given a lot of odd shaped card bases a few years ago (6 ¾” x 3″) so I decided to use these up this year. Most of the cards I made this year are simple, die-cut, as near to one layer as I can get, they needed to be quick to make and easy to post. 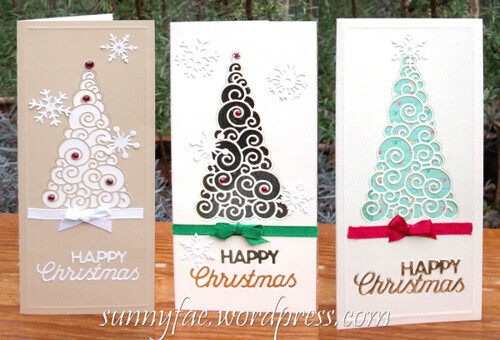 The cards were narrow enough that I could place the whole card flat on the plate and cut the tree directly out of the card base; I backed each tree hole with a coloured paper (cream, green or gold) and glued the trees back into the hole. Then it’s just ribbons sentiments and snowflakes, bang, job done. 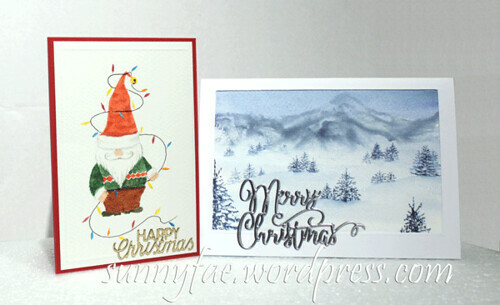 Last but not least I finally painted some Christmas cards whoot! The winter scene I painted last week made a very nice card, I added a small amount of glitter with a sparkly pen to make it a little more festive. This week I wanted to draw/paint a gnome, (no idea why?) I roughed him out in my sketchbook a little to decide how he was going to look then painted him with watercolour on watercolour paper. I like him, even if he does look more like Santa on his day off than a gnome. He certainly looks OK on a Christmas card. So that’s the cards written out, the tags sorted and were not even half way through the month yet! oh so organised hehehe. I love the Santas! 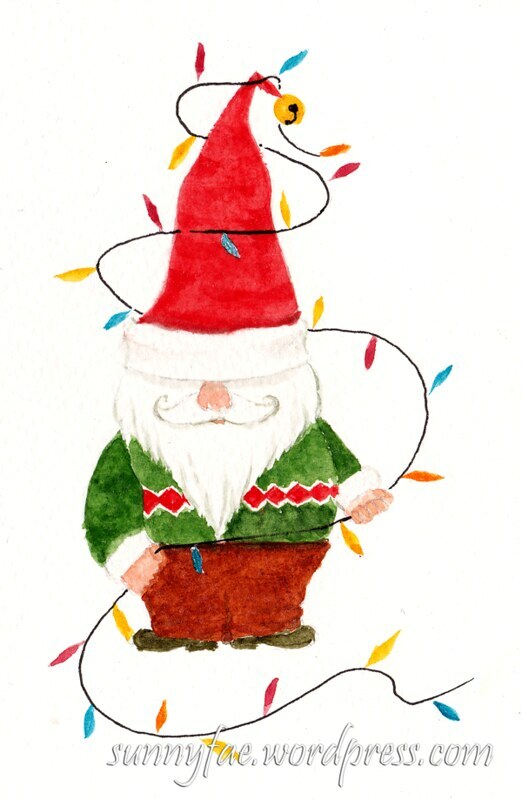 And the gnome Santa. 🙂 How creative you are! Thank you for sharing. 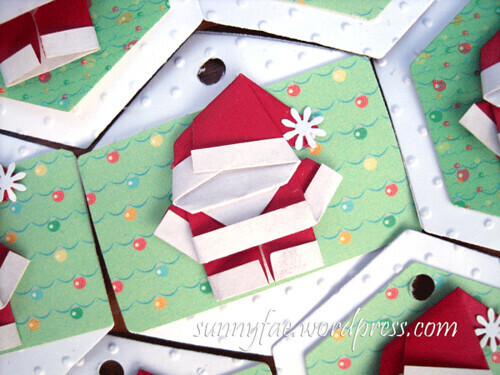 Your Origami Santa Clause is really interesting!! Lovely cards. Love the idea 🙂 Thanks for sharing.